Under the FCC’s Rules, equipment that contains digital circuitry and receivers that tune between 30 MHz and 960 MHz, including the receiver portions of transceivers, must comply with the emissions limitations of FCC Part 15B. These limits are for unintentional emissions from electronic devices, such as from microprocessors and digital equipment, opposed to intentional transmitters, like WiFi, Bluetooth and other radio devices. American Certification Body (ACB) provides Certification for Wireless Devices. We can support you for global market access for your electronic devices, including US/FCC, Canada, Japan, Hong Kong, Asia and European Approvals (CE Marking) for Licensed and Unlicensed wireless products. We work with our clients around the world and around the clock. We understand your time to market concerns and we realize that Certifications are an important timing issue for all manufacturers. Contact us anytime. Certification questions and inquiries are welcome. ACB is your source for radio equipment authorizations including 802.11a/b/g, Bluetooth, frequency hopping spread spectrum, digital transmission systems, WiFi, WiMax, GSM, CDMA, WCDMA, HSPA (HSDPA, HSUPA), marine, aviation, land-mobile, OFDM, point-to-point, point-to-multipoint, EPIRB, PLB, BPL, PDA, radar, ISM devices, Smart Phones, and broadcasting equipment. Nearly all devices which use radio frequency energy, from garage door openers to microwave broadcast towers, are eligible for Certification through ACB. Specific Absorption Rate (SAR), Maximum Permissible Exposure (MPE) and Hearing Aid Compatibility (HAC) evaluations are provided as part of our total Certification package. Do you need International Product Approvals? 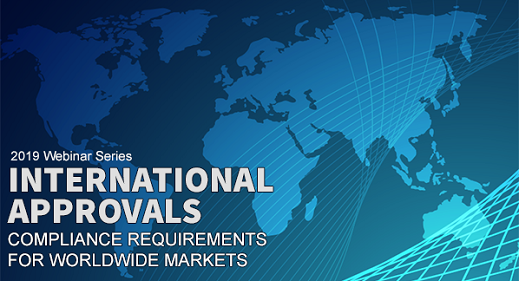 ACB can provide International Approvals / Worldwide Certifications / Product Homologation for over 200 market countries. FREE International Approvals Webinars on the 2nd Thursday of each month at 1:00 PM ET. The FCC issued a long-anticipated Notice of Proposed Rulemaking under ET Docket 18-21 on February 28, 2018 and seeks "comment on proposed rules to permit licensed fixed point-to-point operations in a total of 102.2 gigahertz of spectrum; on making 15.2 gigahertz of spectrum available for unlicensed use; and on creating a new category of experimental licenses to increase opportunities for entities to develop new services and technologies from 95 GHz to 3 THz with no limits on geography or technology." This is a broad NPRM with a lot of impact towards development of technologies and testing methods, truly pushing the state-of-the-art. ACB is active with the mmWave Coalition, the TCB Council and American Council of Independent Laboratories on comments to this NPRM. We will likely see communications technologies that will extend into the hundreds of GHz, which will bear great impact on 5G and IoT applications into the next decade. The comment period ends 30 days after the February 28 issue date. Selling Radios in Europe? Stay in the black, prepare for RED. The Radio Equipment Directive (RED) will be the only route for radio devices to be placed into the European Union from June 13, 2017. Prepare your compliance plan now! Wireless manufacturers will need to obtain CE Marking under the "RED" from that date. ALL radio equipment that is being place on the market must transition to RED, even devices that were approved under the R&TTE Directive. To prove compliance, it is necessary to use Harmonised Standards. The challenge is that there are very few Harmonized Standards to use! In the meantime, ACB has an answer. ACB is a Notified Body (1588) under the RED and can issue "EU Type Examination Certificates" that are necessary for compliance during the transition to a full set of Harmonised Standards. This process involves a review of your product operation and use, analysis of existing regulatory resources, such as draft ENs, standards and industry committee activity and communication with European regulatory authorities. This process is detailed in our ISO 17065 accredited procedures and allows us to prepare the necessary technical and regulatory support to issue an EU Type Examination Certificate. Clients who have used our services for Notified Body support realize how critical this service can be as it allows market access to the 300 million consumers in the European Union. For a quotation, or to discuss further, please contact an ACB office in your region. Our scope includes Certification under FCC rule Parts 11, 15, 18, 22, 24, 25, 27, 74, 80, 87, 90, 95, 97, and 101. Certification to Canadian Radio Standard Specifications (RSS) is also provided from our staff, with a combination of over 200 years radio approvals experience. We provide seamless Certification for North America with ISED Canada Certification Services to RSS requirements of the Canadian Government. In accordance with the Radio & Telecommunications Terminal Equipment Directive and the United States-European Union Mutual Recognition Agreement, ACB is a designated Notified Body for issuing opinions about conformity of Radio and Telecommunications Equipment. Our offices in Beijing can get rapid approval to China’s radio, EMC and product safety schemes. We obtain SRRC and China’s Compulsory Certification (CCC). We provide approvals for SRRC, CCC Mark and MII, all requirements for the applicable product classes. ACB: A Leader in Wireless Product Approvals.